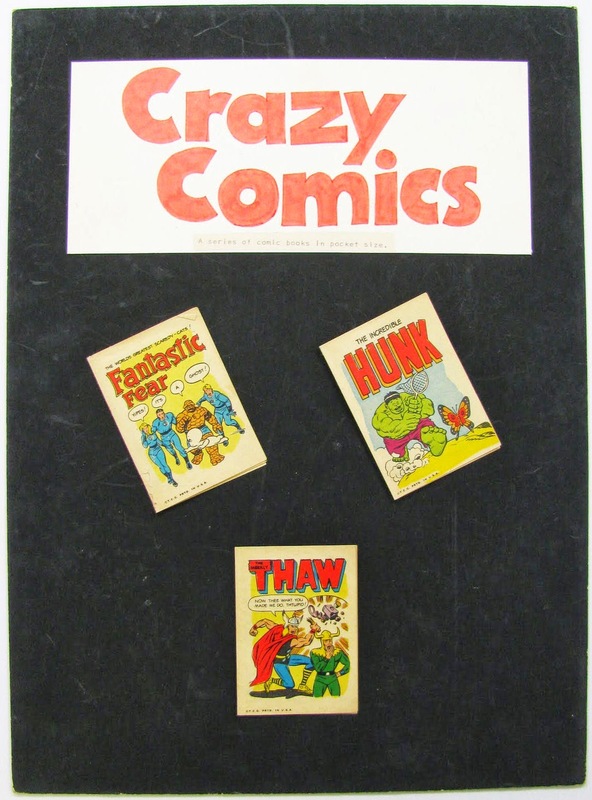 As Woody Gelman's band of merry artists grew in the mid 1960's, Topps started branching out into more esoteric items as the decade wore on. 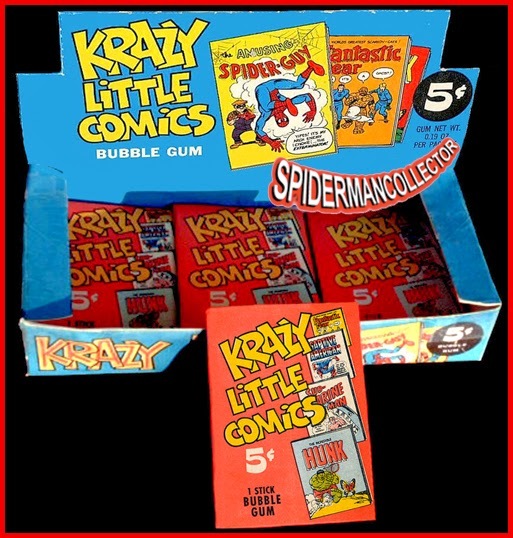 In what must have been a fit of MAD Magazine inspired inspiration, 1967 saw a 16 "card" limited issue called Krazy Little Comics marketed. That little beauty is from comprehensive Spiderman blog with over 8,000 collectible shown of America's favorite webslinger (wow!). Another reason I lean toward a limited release is that you cna find these with relative ease compared to true test issues. They are more properly in the "scarce" category I think and prices for nice, raw books have fallen to about $35-$40 from $75 or $80 of late, although a new find could also explain the drop. The artwork is stellar which makes a lot of sense as it was done by Wally Wood and Gil Kane, with stories by Roy Thomas. 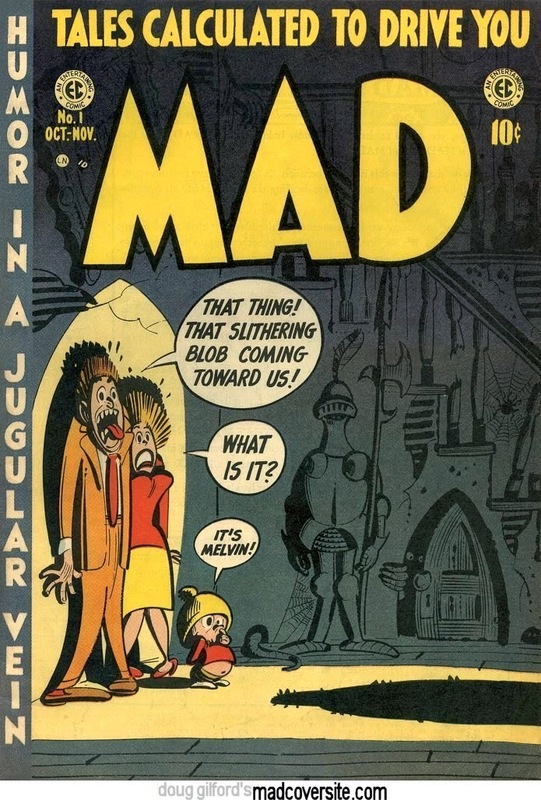 Wood effected many of MAD's comic book parodies in the 1950's and is considered to be one of the finest comic book artists of all time while Kane and Thomas worked on many of the comic books that were parodied. In fact a study of Wood, edited by Bhob Stewart, notes that "some nervous corporate lawyers" put a halt to the series. Considering how much effort had been put into the set, there must have a huge threat of litigation to make Topps pull back. I've already posted this over at the Modern Hobby Guide blog as an update but not everyone here checks over there so forgive the duplicate posting. An earlier post on these cards can be found here. Marty Krim, one of metro Boston's finest Non Sports dealers, has passed along a checklist for the Doeskin cards that were issued in small tissue packages around 1955. As detailed in the Modern Hobby Guide, Doeskin drew from two Topps issues: 1952's Wings and 1955's Rails & Sails. As also detailed in the book, no checklists had been confirmed and the set count was indeterminate but thought to be 100 from each contributing Topps issue. Marty has set the record straight now and determined there are 160 total Doeskin cards. 80 came from Wings and another 80 from Rails & Sails (40 trains and 40 ships). The Wings subset runs from #1-80 and the Rails & Sails from #81-200 but 40 numbers are skipped in the latter. While it seems cruel to skip number such an issue, I doubt anyone was ever able to complete a set of these in the 1950's. I don't think there are that many sets around even today as these are seldom seen. The word from Mr. Krim is that it's hard to find cards even in EX, no surprise given the method of distribution. Marty has a huge stock of the Doeskin cards (hence his wonderful checklist) and can be contacted at martykrim@gmail.com if anyone out there is interested in purchasing same. Marty also has a huge selection of other Non Sports cards as well and is one of the good guys in the hobby so feel free to pepper him with orders! This also means the Doeskin "side checklist" for Rails & Sails in the Modern Hobby Guide is incorrect as it has 20 too many possible cards shown. I never developed a side list for Wings as there was virtually no information available at the time I wrote the book. In addition, The ACC # for Doeskin Wings is F381 and for Doeskin Rails & Sails it's F378. I treat them as a single issue below but that is not definite.